Gary Peters struck twice to book Rustington Football Club’s spot in the Sussex Intermediate Cup semi-finals on Saturday. As well as Peters’ double, Chris Darwin also netted as Blues sealed a 3-0 quarter-final success over rivals Arundel Reserves. The tie was due to be played at Mullets’ Mill Road home but a waterlogged pitch meant the fixture was switched to Rustington’s Jubilee Fields ground. Blues, who were reinstated in the competition after division-lower Hollington fielded an ineligible player in their last 16 victory last month, kept their hopes of the treble alive. Rustington take on Roffey in the SCFL Division 2 Challenge Cup on Saturday and sit third in league at present - four points off leaders Alfold with four games in hand. Blues boss Jon Tucker admits the treble is unlikely but wants his squad to give it a good go. He said: “It’s the first time we’ve played a competitive match since December 23, so I was really pleased with how we performed. “Arundel Reserves are full of youthful, talented players and they gave us a good game. “I was really pleased with how we performed and kept our treble hopes alive in the process. Blues withstood an early spell of Arundel pressure and went ahead on the half-hour. Good work from Darwin saw him tee up Peters for his first of the afternoon. Darwin then struck 20 minutes from time to all but put the game past Mullets. Arundel pushed men forward in the closing stages and Blues caught them on the counter late on. 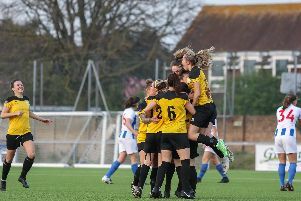 Peters struck for the second time with less than a minutes left to ensure Rustington reached the Sussex Intermediate Cup semi-final. Blues travel to second-placed Roffey for a SCFL Division 2 Challenge Cup second-round encounter on Saturday.